with common sense+knowledge+heart, terrarium care can be easy! Plant care is easy an intuitive, if you are willing to have a relationship with your plants. Use your brain and knowledge, your senses when dealing with your plants and environment, and a little bit of heart. THE GOAL WITH PLANT CARE IS TO RE-CREATE, AS BEST YOU CAN, THE PLANT’S NATIVE ENVIRONMENT, SO THE PLANT WILL THRIVE. You’ve already done some of the work, by selecting a NOBLE TERRARUM, or by building a terrarium in one of our workshops. We only use plants in terrariums that are TRUE TERRARIUM PLANTS. These plants are going to thrive in the moist, greenhouse-like environment of the terrarium, and have been proven to do so. 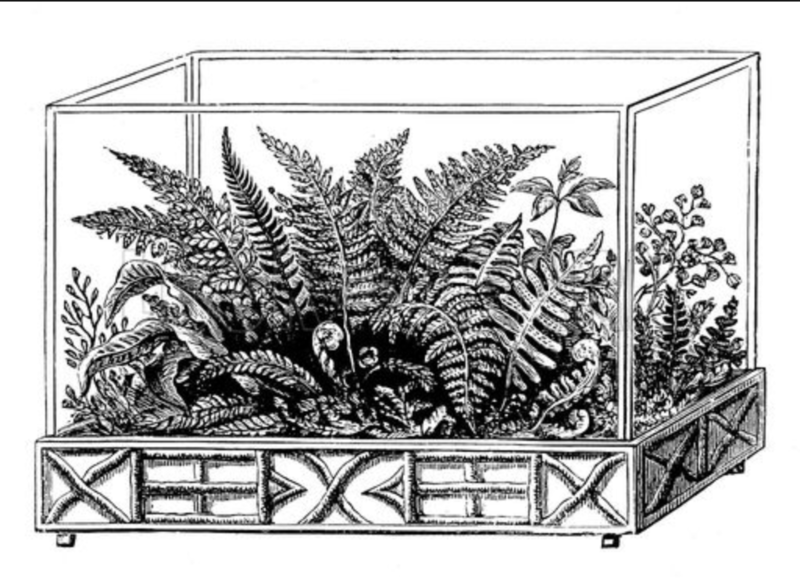 A terrarium, by nature, is a closed or semi-closed container that promotes humidity, and a tropic-like temperature, over-heating if placed in sustained, direct sun. It is ideal for growing plants that thrive in these conditions: medium to high moisture and humidity, and low to medium light. 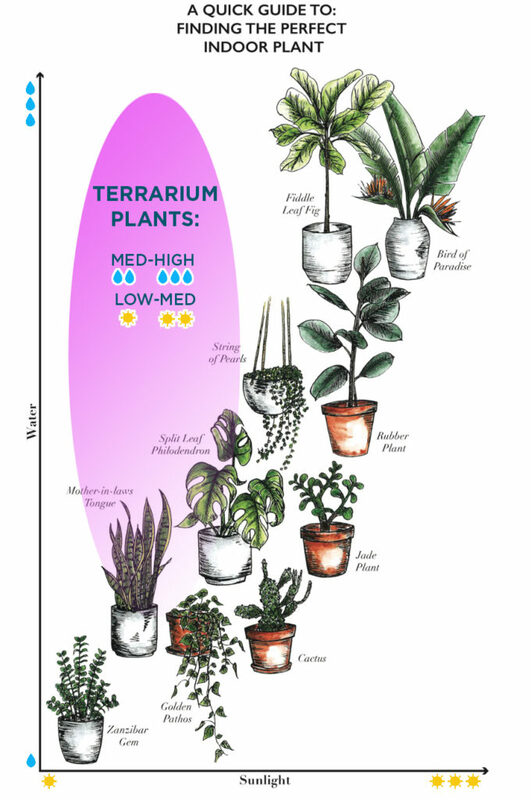 Correct PLANT SELECTION, AND PLACEMENT, are your first steps in having a thriving terrarium. 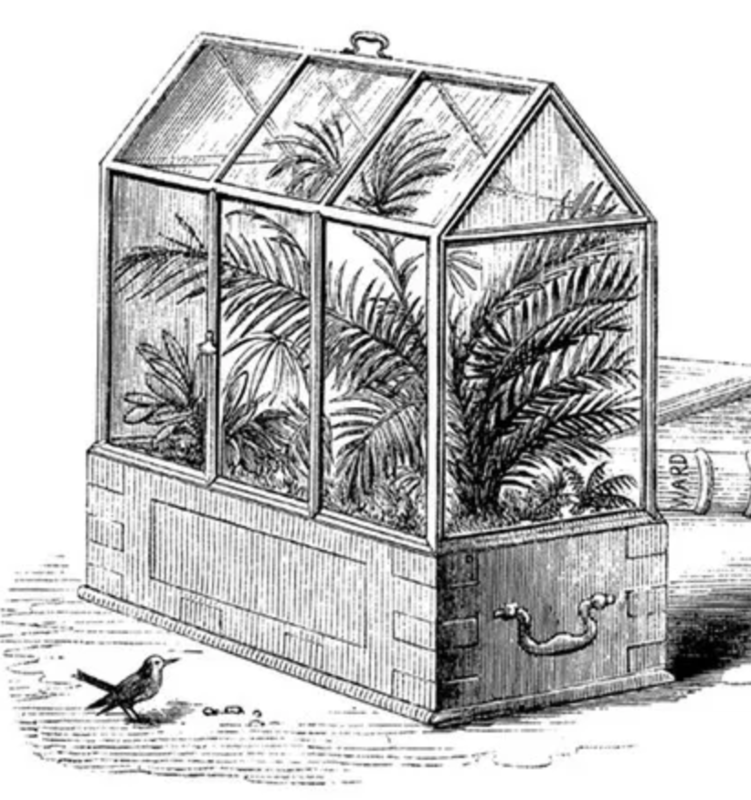 Dr. Nathaniel Bagshaw Ward invented the terrarium, almost by accident, in the mid-1800s in London. Originally, they were known as “Wardian Cases”. 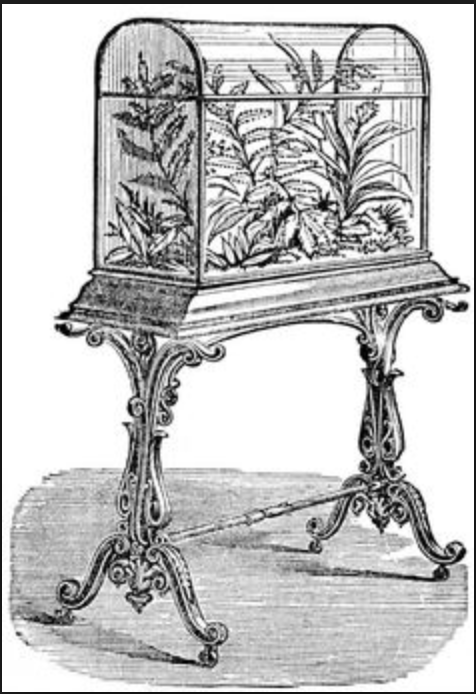 These glass cases would go on to advance botanical science, influence world economies, and ring in a design trend that we still feel today. 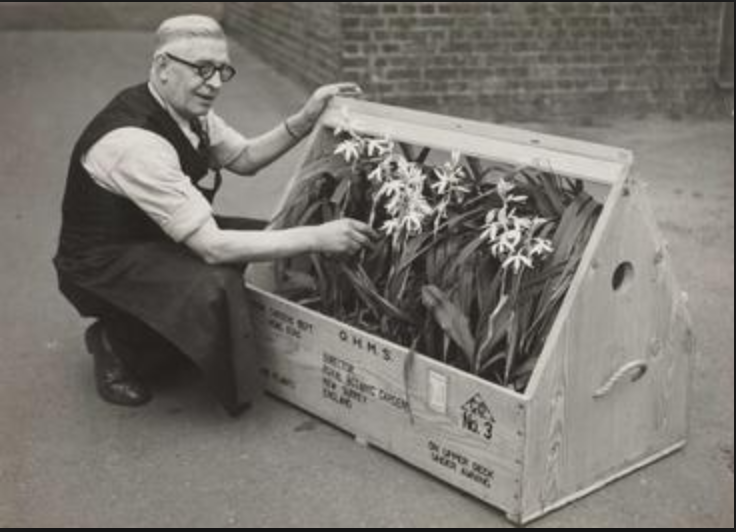 “The technology Ward used was readily available, but the concept of a sealed terrarium was groundbreaking. While glasshouses were relatively common among professionals, the theory hadn’t been applied on a smaller scale. Greenhouses use solar radiation to heat the space, creating a warmer environment that is favorable to tropical plants. Both systems use similar technology and structure, but greenhouses usually require additional watering and human interference. Terrariums will be happy in bright, mostly indirect light, ideally in a north -facing window, or in a room with lots of bright ambient window light, such as on a table or wall a few feet away from a sunny window. 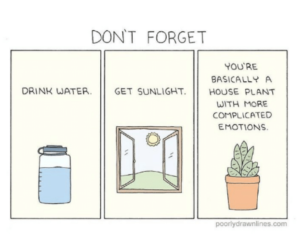 Note: all plants do need some amount of natural light. If your space has none, or it is very weak (such as in a lower-level apartment, or an interior hallway with no windows, you’ll want to place your plant elsewhere, or look into installing a proper grow lamp. What may feel like “bright” indoor light to us is often still darker than shaded areas outdoors. Get to know how your space relates daily and seasonally with sunlight (It’s quite interesting!) and place your terrarium accordingly. NOTE: Keep away from extreme heat or cold (do not place on top of a radiator). Notice the path of the sunlight in your space. An unobscured south-facing window (if you are N of the equator) will have the most all-day light. A terrarium will need to be placed ideally in a north window, or near an east window, or in the ambient light, away from the direct beams of the sun in a bright, sunny south or west-facing space. 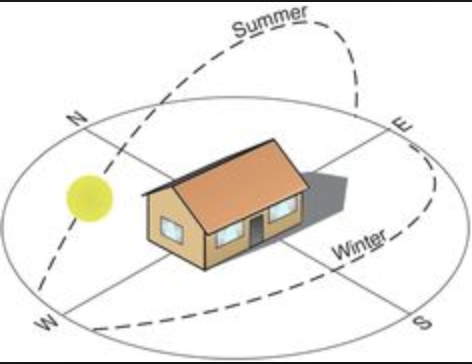 Notice that the sun’s path is lower toward the southern horizon in the winter months, and higher overhead in the summer. That means sunlight will project further into a south-facing window in the wintertime. Interesting! More here. FIRST, NOTE THAT WITH A CLOSED OR SEMI-CLOSED VESSEL- a true terrarium- WATER IS MORE OR LESS TRAPPED, TO EVAPORATE AND RECYCLE WITHIN THE VESSEL. Minimal evaporation will occur, and only a minimal amount of occasional air circulation or water addition may be necessary, if at all*. Distilled water is suggested, so minerals do not build up on the inside of the glass or on plants. However, if not misting, tap water is fine. Also, again, you shouldn’t need to water more than a small amount every few months, if you place your terrarium in the right spot. Remember, it shouldn’t get direct sun, but should get bright, ambient or indirect natural light, and does not get too hot. Watch soil, sand and moss- It shouldn’t ever dry out completely. Thanks to Noble Terraria, plants are paired with vessels that are likely to support proper plant life, *if placed and cared for properly. Thanks to the magic of the terrarium vessel- especially our bottle, cloche terrarium, or lamp terrariums (anything more closed than open)- trapping most of the water vapor, and recirculating it, your terrarium will retain most of the water that was added originally. In general, your terrarium moss and soil should stay moist (often this means doing nothing, and just checking on it from time to time). If you feel it’s time to add water: Drip (or pour very slowly) a small amount water into your terrarium as needed. You probably won’t need to add more than a tablespoon or two. Wait in between “sips” of water, to allow it to soak into the substrate. Add a small amount more, if needed. You’ll want that soil and sand moist, without it being so saturated that it puddles on the surface. Vacation care for more open terrariums: Covering your terrarium with clear plastic or a piece of clear glass, so that there is a very small opening for air flow, your terrarium can go a month or more, depending on conditions. Make sure there is enough water so that soil stays moist. If misting any plant (in a terrarium, or not), remember to use distilled water. Also, don’t just mist the surface; remember that the roots and soil need moisture, as well. Condensation is a normal part of a healthy terrarium ecosystem- that’s the water that’s evaporated getting ready to “rain” back down onto the plants, and it indicates a good level of moisture for the mosses and damp-loving plants inside. CLEANING:Occasionally, you may notice some “gunk” on the inside of the glass. This is natural algae growth. If you’d like, you can “squeejee” the inside of the glass carefully, using a long pair of bent tweezers, or a chopstick with a piece of lightly damp paper towel rubber banded to the end. You’ll want to clean the class in long, vertical strokes, moving down toward the soil. Avoid crushing the moss, or spinning your terrarium while cleaning the glass, so that you uproot plants inside. Be gentle, and enjoy your little world of green goodness. You should have a long, healthy life together! UH-OH: Should a plant die, or become brown, black, yellow, moldy, or odd-looking, pluck the dead part out to keep the remaining plants healthy. You can add new, live moss from outdoors, or from a garden store (make sure it isn’t “preserved” or dyed), if you need to replace any moss. Terrarium advice, custom terrariums, planting design and installation, houseplant consultations, and retail inquiries? Want to book your terrarium event with Noble Terraria? Contact us today! thanks to poorlydrawnlines.com for the inspo! Let us know how it’s going! We wish you a healthy, wealthy, joyful life in your very own natural space.